Early morning Few skies trended to increasing cloud cover (Ovc) until mid afternoon when skies became Broken. SW winds were light. Overnight temperatures dipped below freezing for the first time in 4 days at 8000 feet and were in the upper 20's with clear skies. Daytime highs rose rapidly by noon and were at least 10 degrees higher than on Saturday. Low 40's were observed late in the day at 9500. Clear skies and below freezing temperatures overnight allowed for a decent refreeze that ranged from 10 to 15 cm down. Turning conditions were excellent until at least 1200 on S and SW aspects above 8500. And, reports from mid Big Cottonwood Canyon were similar. Poor snowpack structure pertaining to isothermal snowpack observations from top to bottom in the mid elevations to at least 9400. 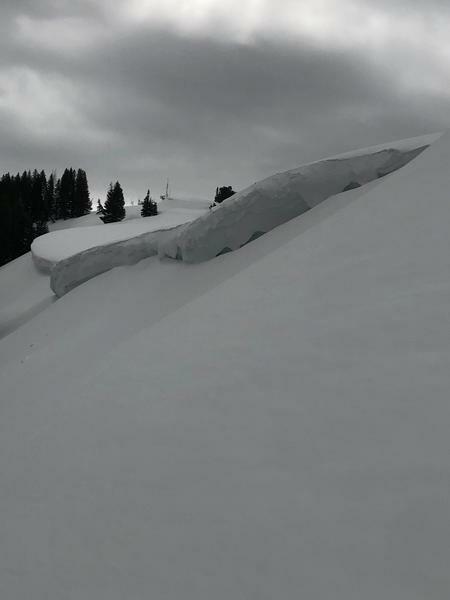 Drainage channels allowing for snowpack to continue to transition into a spring/summer snowpack. Another night forecast for mostly clear skis and below freezing temps should allow for another day of transitional corn-like riding on aspects on the lower half of the compass. North facing/steep upper elevation terrain observed had a 5 to 8 cm surface layer of damp pencil hard slab resting on medium grained cold dry snow. Very steep terrain with this structure may have produced pockets of shallow slab activity in the morning hours before this wet layer grew larger due to rising daytime highs. Picture of just one example of the many large overhanging cornices depicts this obvious problem. Upper elevation steep shady terrain continues to shed their upper layers with the intense daytime highs, and until this area transitions completely this problem may continue to be a minor concern. 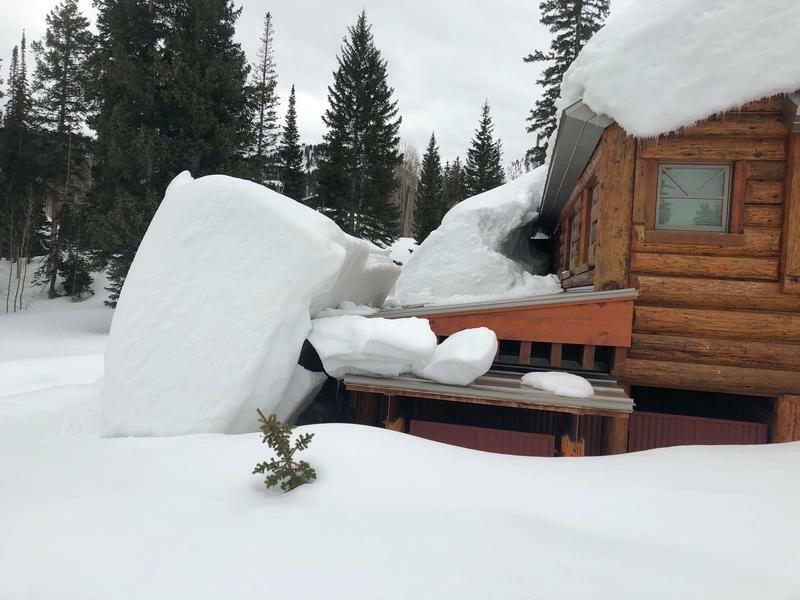 First picture is a very dangerous natural roof avalanche that released on Saturday April 6th. Second picture is just one of many cornice areas in the Central Core.